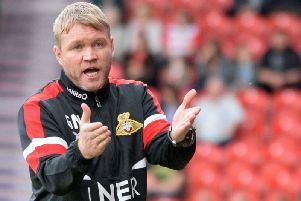 In-form Doncaster Rovers lost a 2-0 lead to suffer defeat at Wycombe Wanderers today in League One. John Marquis reached 20 goals for the season but it was not enough to condemn Gareth Ainsworth’s battlers to a fifth successive defeat in League One. Wanderers looked dead and buried at Adams Park when Marquis and Tommy Rowe put the high-flying visitors 2-0 up in the second half. But a Paris Cowan-Hall double - the second in added time - either side of Curtis Thompson’s equaliser, handed Rovers just their second defeat in 13 games in all competitions. In the first half, Doncaster stopper Ian Lawlor pulled off a good save to keep out Cowan-Hall’s cross-shot, while down the other end Matty Blair fired wide from a promising position. Mallik Wilks was well denied by Ryan Allsop after the break before James Coppinger’s strike whistled just over. On the hour Marquis opened the scoring with a well-taken first-time finish and he then turned provider as substitute Rowe hit the second with an easy tap-in just three minutes after coming off the bench. With 13 minutes left Cowan-Hall sparked a late revival with an unstoppable strike into the far corner. Curtis equalised with a 25-yard effort in the 90th minute before Cowan-Hall’s looping header deep in stoppage time stole the points.